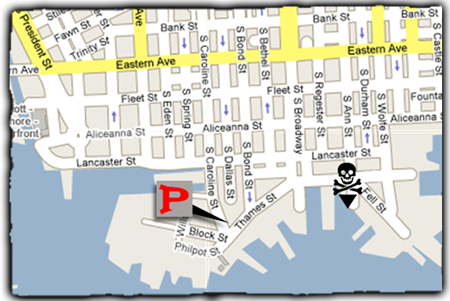 Urban Pirates - Baltimore is located in the Fells Point neighborhood. The Fearless boards on the Ann Street Pier located at the end of South Ann Street at Thames Street. Ann Street is located near the Broadway Square and the Baltimore Water Taxi Stop #11 in Fells Point. If you need any assistance on parking or directions, please contact Urban Pirates! Follow signs for Downtown Baltimore and take exit 53. Follow signs for Inner Harbor/Downtown. At the 3rd traffic light turn right onto Pratt Street. Follow Pratt Street approximately 14 blocks to Broadway. Turn right onto Broadway and continue until the road ends. Turn left on Thames Street and Urban Pirates will be 1 block ahead on the right. Take exit 57 for O'Donnell Street toward Boston Street. Follow O’Donnell Street and merge onto Boston St. Turn slight left on Aliceanna Street. Continue to second light and turn left on Ann St. Urban Pirates will be ahead 1 block. As I-83 South ends in downtown Baltimore it becomes President Street. Follow President Street to Eastern Avenue. Turn left onto Eastern Avenue. Follow Eastern Ave to South Broadway and turn right. Continue on Broadway until the road ends and turn left on Thames Street, Urban Pirates will be 1 block ahead. Fells Point also offers "pay to park" options along the streets and center square. If you choose to pay to park, please read the hourly limits and directions carefully. Allow for plenty of time to find a parking spot, pay for parking, and make your way to the ship. Premium Parking at a nearby lot. See available parking on Premium Parking. Parking can be booked online through our partner Parking Panda at a nearby parking lot. Reserve your parking online now and enter discount code URBANPIRATES at checkout. See available parking on Parking Panda.